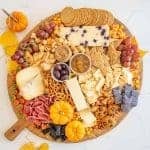 Easy Halloween Cheese Board | Fun Halloween Party Food Idea! 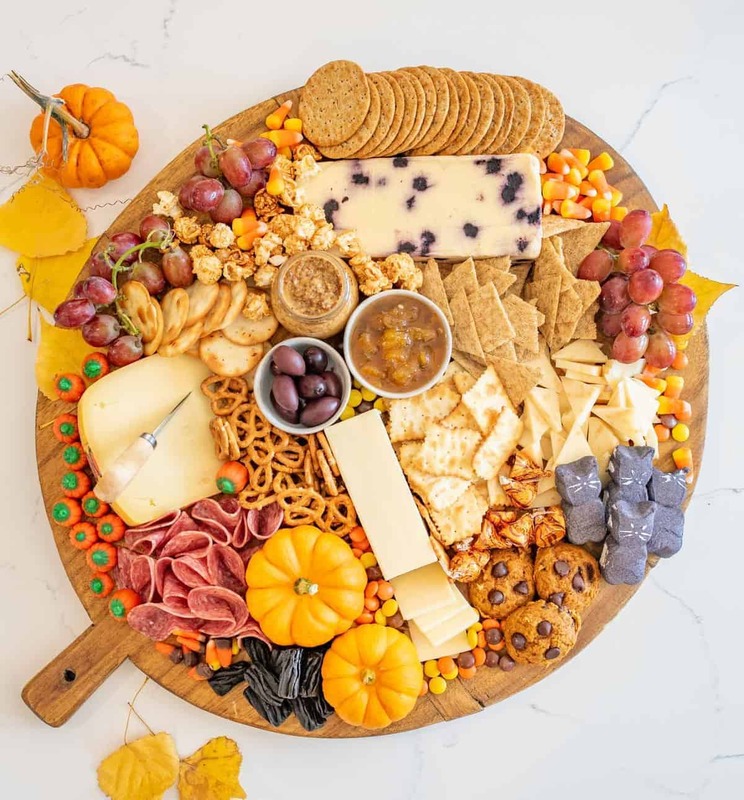 Fun and festive Halloween Cheese Board made with simple cheese, crackers, pumpkins, and or course, lots of Halloween candy. Who doesn’t love a cheese board?! 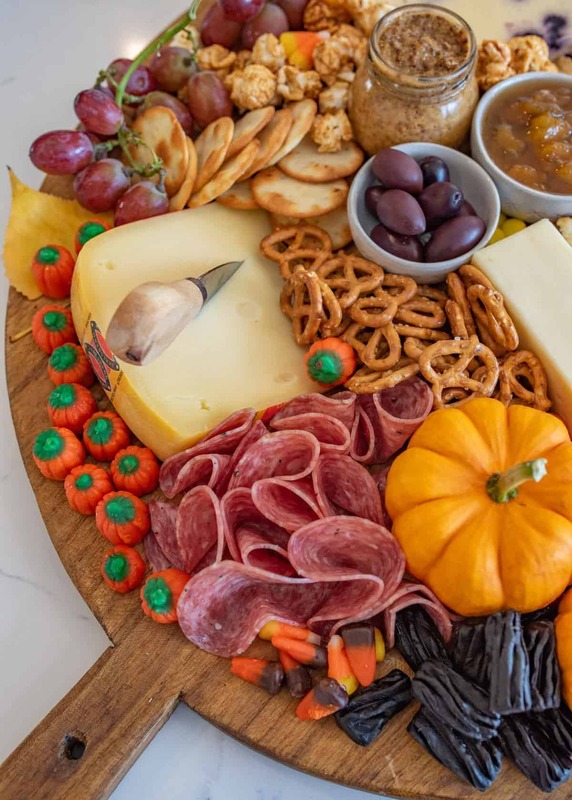 Add some candy corn and turn it into a festive Halloween-themed cheese board and you really have yourself a party. I love how easy cheese boards are to put together and how much fun they are to eat! They are great as an appetizer and even better for a casual meal with friends. 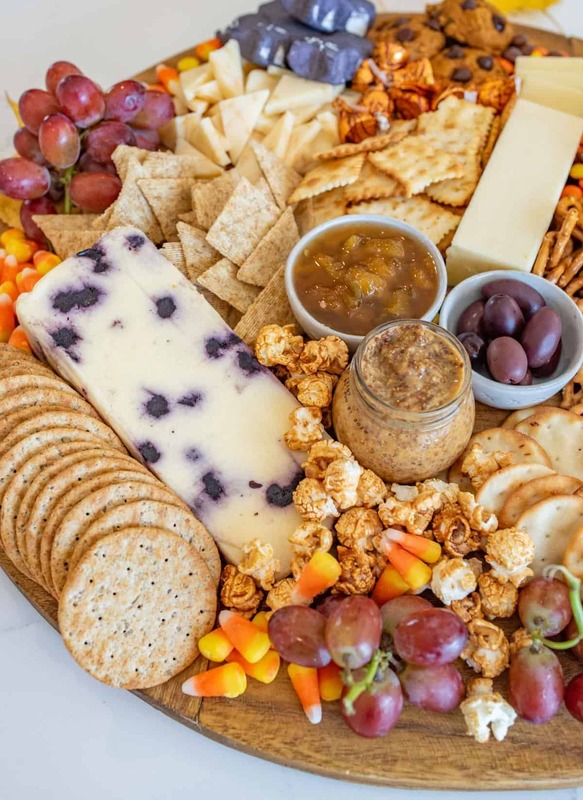 When making this cheese board, I tried to pick a color theme – orange and purple. I picked cheese with purple in it (a mild Wensleydale with blueberries in it), purple grapes, black licorice, and olives; lots of orange in the form of candy, crackers, pumpkins, and leaves! It was a simple way to add a bit of cohesiveness to the Halloween theme. The candy really set the tone, though. Who doesn’t love black cat Peeps, candy corn, and Reese’s Pieces? If you are new to making cheese boards, have no fear. There’s no right or wrong way to do it! As long as you have some cheese, crackers, and a few little nibbles of something sweet and something salty to go with it, you’ll be set. Once you get into it though, I promise you’ll be hooked! This post is part of a little Halloween event my friend Tara from Tara Teaspoon and I are hosting! We’ve dedicated a few days in a row to sharing our favorite Halloween recipes! Today Tara is sharing the cutest Halloween Chicken Sliders. Seriously how cute are those? I need to make a few of those for my next Halloween party! And I know my kids would love to eat a sandwich with eyes! There’s no wrong way to cheese board! That’s the beauty of it. You can add just about anything you’d like (such as nuts, a caramel apple, ham, or pickled veggies) or take off anything you don’t like. Thomas bought these very inexpensive cheese knives for my stocking last Christmas, and I love them! I use a few nice boards and these knives over and over again. Variety is fun! Add what you like and leave off what you don’t, but try to have a nice variety to make things interesting. I get most of these cheeses at the little town next to me or Costco. Don’t feel like you need to have some great cheese knowledge to pull off a cheese board. Stick with what you like! I usually include a cheese with fruit in it, any sharp cheddar, a smoked Gouda, and then something new to me. Don’t over complicate things, good cheese doesn’t have to be unpronounceable or a million dollars a pound. 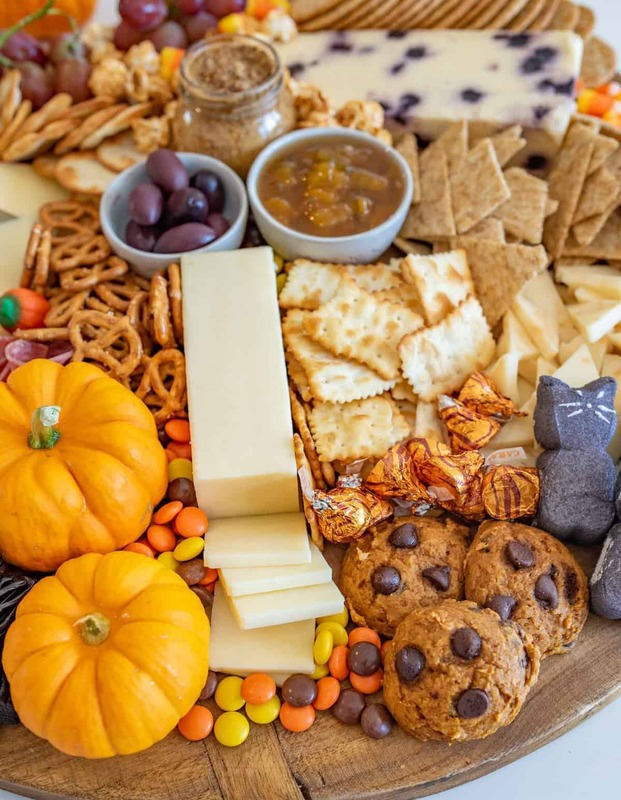 Fun and festive Halloween Cheese Board made with simple cheese, crackers, pumpkins, and of course, lots of Halloween candy. Place your cheeses on your board. Feel free to pre-slice one of the cheeses if you desire. Place condiments (jam and mustard) in small serving bowls and place on board. Wash, dry, and place mini pumpkins on board. 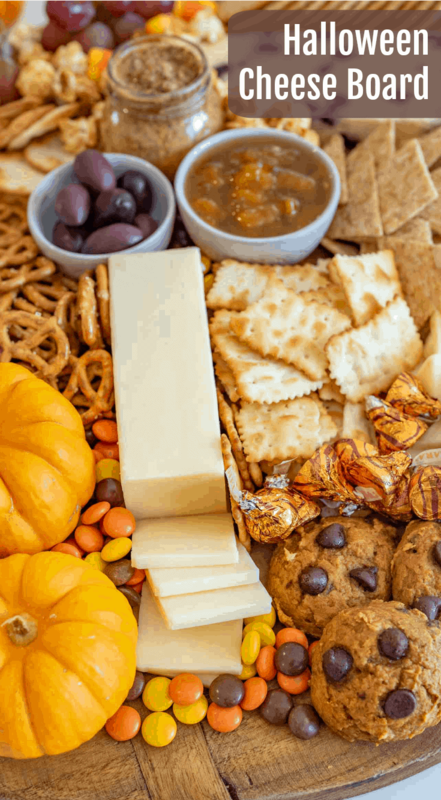 Place crackers and pretzels around the cheeses. Fill in the gaps with candies and other treats. There’s no wrong way to cheese board! That’s the beauty of it. You can add just about anything you’d like (such as caramel popcorn, nuts, or olives) or take off anything you don’t like. How fun and simple is this board? I get together with a group of moms on Tuesdays and I made this, took my pictures, and then took it to eat with friends. It was SO much fun to share. There’s something wonderful about eating good cheese with good friends. I highly recommend it. I love this specialized idea! 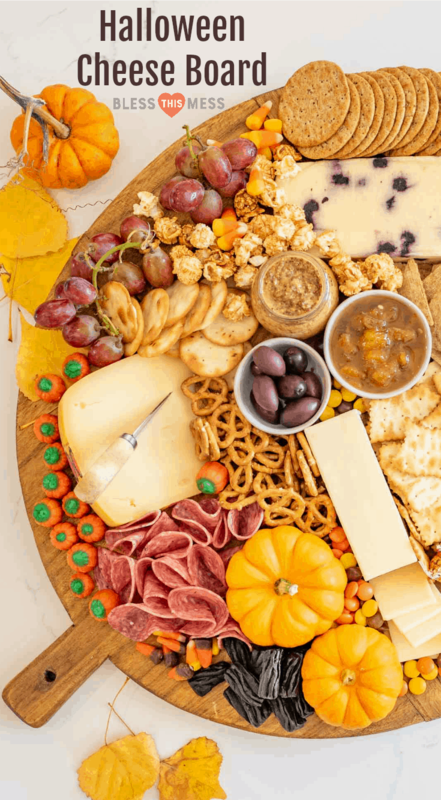 How fun to turn a simple cheese board into a Halloween extravaganza with just a few tricks. You’re genius!